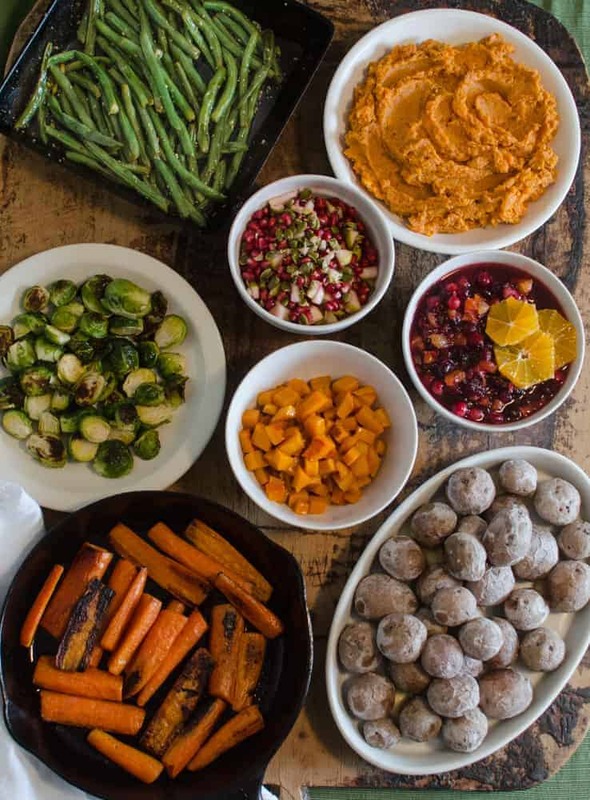 Five ingredient sides will save you time on Thanksgiving – and there are 8 easy recipes for them here! Bonus: everything is easily made vegan/gluten-free. So I know that I set you up with all kinds of pie recipes this week, and I had so much fun making them, but I didn’t forget about the rest of the holiday dinner! I feel like we need something healthy after all that dessert, don’t you? I have created 8 different healthy side dish recipes for you today, and all of the recipes have FIVE ingredients or fewer. How’s that for awesome!? The beauty of these five ingredient sides is that you can serve them all fall and winter long. You could pick one or two to try for dinner this week. With fewer than 5 ingredients each, these are recipes that you are going to come back to again and again. I like to make a few of these for dinner when I have a whole chicken or a pork roast in the slow cooker. You could also make some or all of them for your family for a holiday meal. 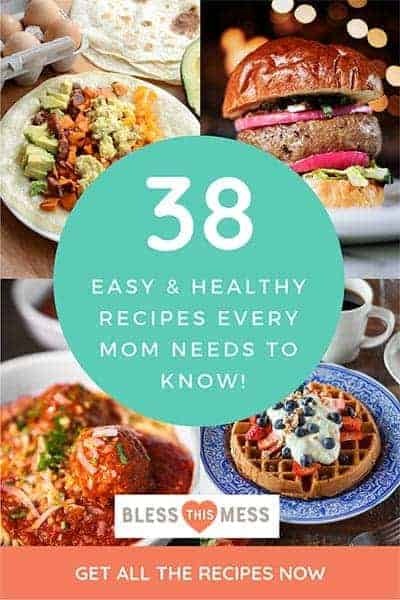 I can’t wait for you to try these healthy simple dishes. You are going to love them! Bonus points for these recipes: all of these healthy five ingredient sides can be made gluten-free, vegan, egg-free, nut- and peanut-free, and just about all the other things-free. 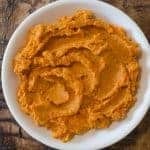 This is great because I know lots of us like to have some good gluten-free and vegan options for guests coming to our home. These recipes are super allergen-friendly, which is nice. Mashed potatoes are awesome, and sweet potatoes are even better, but roasted and then mashed sweet potatoes are my all-time favorite! When you roast the sweet potatoes, it makes them extra sweet (roasting things is magic like that) and it doesn’t add any extra moisture to the potatoes (like boiling does). You simply cut the potatoes in half, give them a good coat of olive oil, and stick them in the oven. Scoop out the soft cooked flesh when done, and then mash with a little salt, cinnamon, and some butter or coconut oil, and you are in business! These are sweet and salty and oh-so-simple. I love this recipe and make it often. It makes a great top for shepherd’s pie too, if you want to make a double batch. Mashed sweet potatoes are all the things sweet and salty dreams are made of. This is the my favorite 5 ingredient side dish all year long. Preheat the oven to 400 degrees. Line a baking sheet with parchment paper or baking mat for easier clean up (not a must, it just makes things easier). Wash the sweet potatoes and then cut them in half from end to end and place the potatoes on the baking sheet. Drizzle the olive oil over the cut potatoes. Use your hands or a pastry brush to coat the outside and cut side of each potato half with the olive oil completely. Place the potatoes on the baking sheet cut side down and roast them in the hot oven until fork tender, 25-35 minutes. Remove the potatoes from the oven and let them cool enough to handle safely. 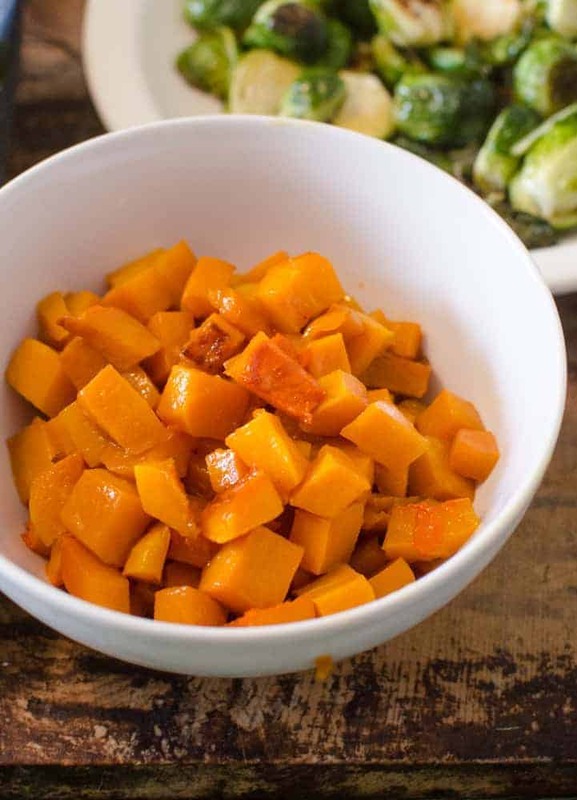 Use a spoon to scoop the soft sweet potato flesh from the skin and place it in a medium bowl. Add the melted butter or coconut oil, salt, and ground cinnamon. 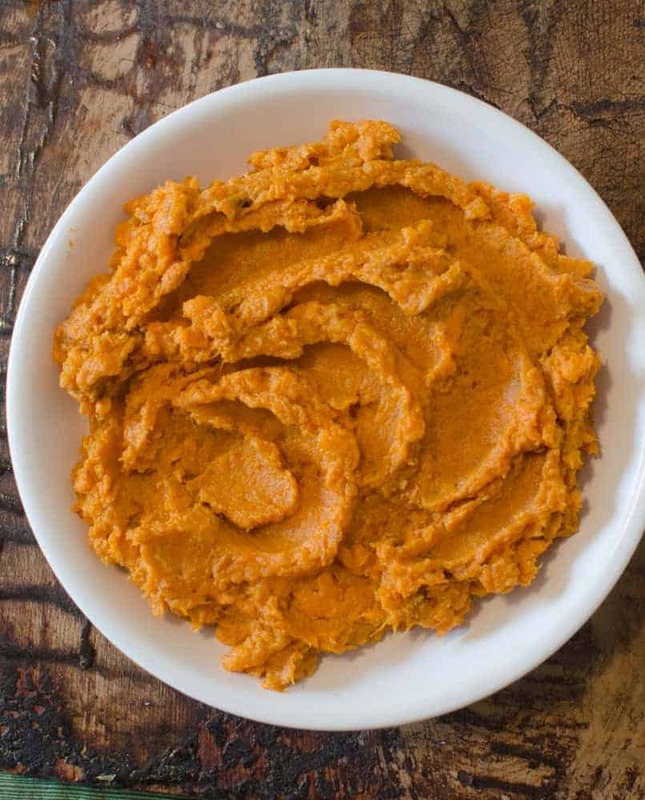 Use a fork or a potato masher to mash the sweet potatoes until they are smooth and creamy. Taste for salt and adjust as needed. Serve warm. I know that Brussels sprouts get a bad wrap, but that’s because you’ve been cooking them all wrong. Don’t boil them; roast them! Something magical happens when you roast them and they char a little on one side. These are simple to make and fun to eat. You don’t need much more than a little olive oil and some salt and pepper for this recipe – just be sure to not crowd the pan. These don’t reheat great but that’s ok, because we hardly ever have leftovers. 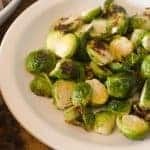 If you don’t love Brussles sprouts yet this 5 ingredient side dish will change your mind. 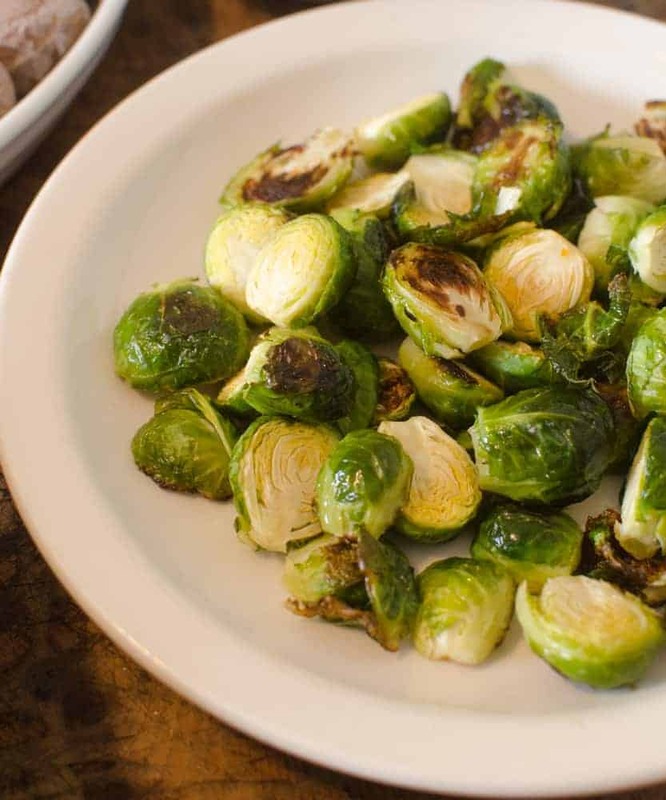 Pick Brussels sprouts that are bright green and have nice firm leaves on the outside. Wash and trim the bottom of the sprouts. Cut each sprout in half and add them to a small bowl. Drizzle with olive oil and toss to coat. Place the Brussels sprouts on a baking sheet, cut side down. Don’t crowd them too much on the pan (that’ll make them steam and not roast, and we are after roasting here); use a second baking sheet if you need to. Roast for 15 minutes or until fork tender and starting to char. Taste and adjust the seasoning as needed and serve right away. Long live the butternut squash. This is such a simple way to enjoy it, and if you have leftovers, you can throw them on all the things. I love butternut squash in quesadillas, chili, and eggs. Make a double batch, because the leftovers are so good. I like to add a little maple syrup to the squash halfway through cooking so that it can caramelize on it a bit. Don’t put maple syrup on in the beginning though, because it will burn in the oven before the squash is done cooking. This is so good with a heavy hand of kosher salt on top, too. That sweet and salty combination is my favorite. Easy real food at it’s best! 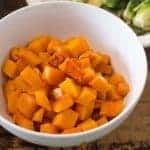 Sweet and salty caramelized butternut squash is the perfect five ingredient side dish to add to any meal. Preheat the oven the 375 degrees. Remove the skin and the seeds from the butternut squash and cut the flesh into 3/4 inch cubes. I ended up with just over 4 cups of cubed squash. Toss the cubes with coconut oil or olive oil and place them on a rimmed baking sheet. Sprinkle with salt. Bake for 20 minutes. Remove the pan from the oven and gently flip the squash over with a metal spatula. Drizzle the maple syrup over the squash and return the pan to the oven. Cook for another 15-25 minutes, stirring after 10 minutes, until the squash is tender and the maple syrup starts to thicken. Place the squash in a serving bowl, drizzle any leftover syrup from the pan onto the squash, adjust the salt to taste and serve right away. The maple syrup will burn if left too long in the oven. Keep an eye on it! I had never even heard of salt potatoes before last summer, when I got to spend a fun few days with Rebecca (Foodie with Family). She’s raising her five boys in upstate New York, and these are one of her favorite regional dishes. She made them for us one night and I have never gone back! The idea is that you boil little bite-sized potatoes in super salty water (3 quarts of water with 1 1/2 cups of salt in it). You dot the hot potatoes with a little butter and you eat them hot in a bite or two, dipping them in extra butter as needed. This is now my one of my all-time favorite ways to eat potatoes, and it’s so simple. Can you see the dusty film on the outside of the potatoes in the picture? That’s some of the salt. Something magical happens to the inside of the little potatoes too. I’ve never had a potato that is so fluffy and creamy. 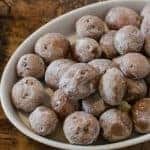 You must try these salt potatoes as soon as possible; they are going to change your potato world. 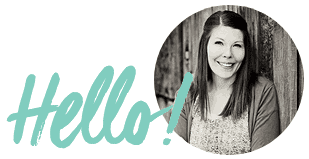 You can find her whole post about salt potatoes here if you’d like a little more information. I probably wouldn’t have tried these on my own, but I’m so glad she made them for me. I’m a salt potato convert, and I’m here to get you hooked, too. You’ve never had a better potato until you’ve eaten a salt potato. This five ingredient side dish is going to blow your mind. Add the water to a large pot and bring it to a boil over high heat. When the water starts to boil, add the salt and stir until it dissolves. Add the potatoes to the pot, one or two at a time, taking care not to splash yourself. Return the water to a boil, lower heat to medium and simmer until the potatoes are tender, between 15 and 25 minutes (see notes to help determine doneness). Pour the water and potatoes into a colander in the sink and leave to air dry for 5-10 minutes. Transfer the potatoes to a serving dish and dot with the pieces of butter. Serve warm with extra butter for dipping. *Salt potato kits, sold all over Upstate New York, use a very specific size of potatoes; Size B, Grade US no. 2. 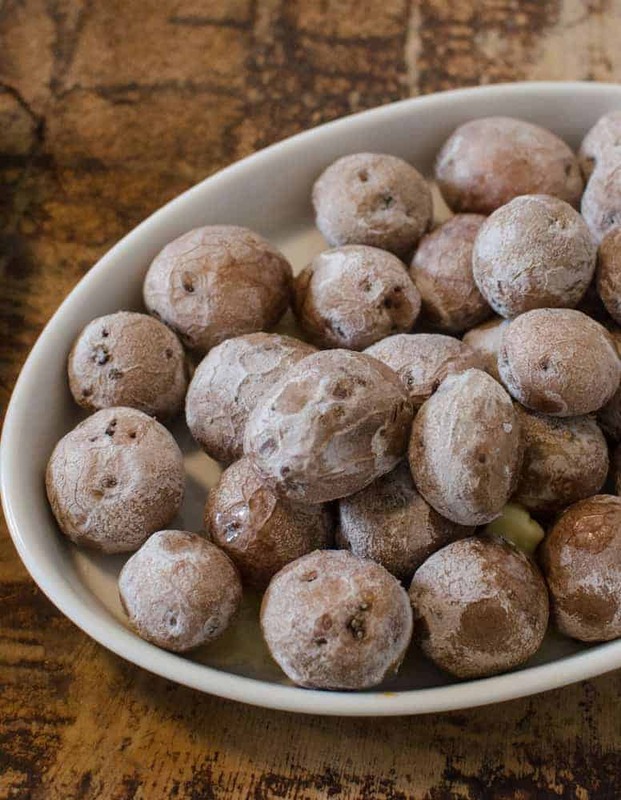 While most grocery stores don’t define their potatoes using this method, you can’t go wrong buying small creamer potatoes that are one-or-two-biters. The shape of the potato doesn’t matter at all. **To test your potatoes, use tongs to lift a large potato from the boiling water. A skewer plunged into the potato should pass through the potato completely if it is done. Butter and green beans, enough said. Make sure you get some good quality green beans for this. I bought mine a few days before I planned on using them, and that was a mistake this time of year; lots went bad in the fridge. Look for young tender beans that are no thicker than a pencil and are bright green with no blemishes. 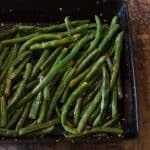 I like this recipe because you boil the green beans and then you sauté them. I love the flavor of the beans sautéed in butter and garlic, but you get a properly cooked bean with a great texture by boiling them first. It might feel like an extra step, but it’s worth it and really only takes a few extra minutes. These are so good and you’ll be making them again and again. This recipe comes from my friend Mary’s cookbook (that I love! ), The Weeknight Dinner Cookbook, which is full of simple quick meals my whole family loves. Bless you delicious five ingredient side of green beans. You’ll be making this dish over and over again, not just at Thanksgiving. Bring a large pot of water to a boil and add a tablespoon of salt. Add the green beans to the boiling water and let them cook for 2-4 minutes, until they reach your desired tenderness. Remove the green beans from the boiling water and stick them in a bowl of ice water (to stop the cooking process). This method is called blanching the beans. It’s great because it works really well for cooking beans thoroughly, but you can still add flavor on the stove top. Don’t skip this step. When the beans are cold, dump them into a strainer and then pat them dry with a clean tea towel. In a large skillet over medium heat, warm the olive oil and butter. When the butter melts, add the minced garlic and stir until the garlic is fragrant, about 15 seconds. Add the green beans, salt, and pepper, and stir to coat the green beans in the butter and garlic mixture. 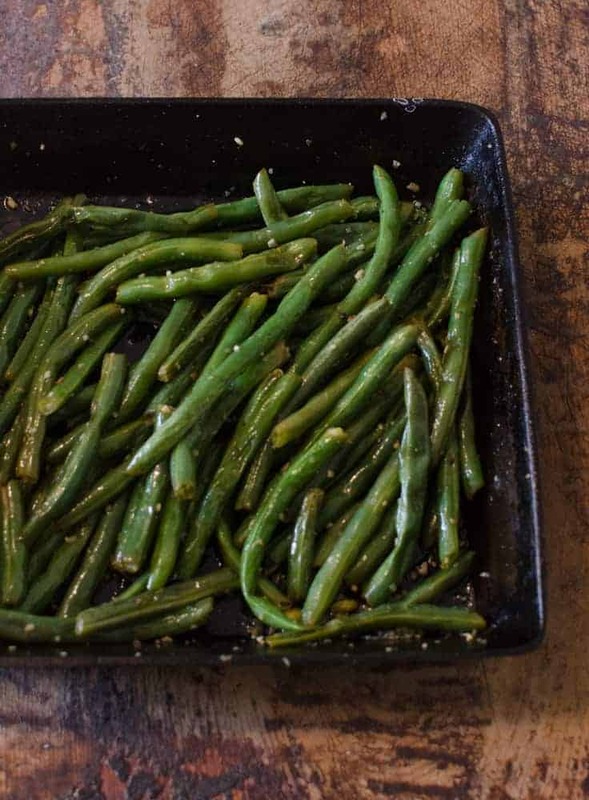 Cook for 3-4 minutes, until the green beans are hot and well-coated in the butter. Adjust the salt to taste and serve right away. These simple carrots have a lot of flavor and are just plain pretty on the table. You are going to want to use large whole carrots and just do the cutting and peeling yourself (no baby carrots here) to ensure even cooking. You simply sear the carrots in a little olive oil and then turn them over and pop the whole pan in the oven. The sear makes them pretty and makes them taste so good, and a little time in the oven helps them to finish cooking all the way though. They are bright, a little crunchy, and perfectly sweet. 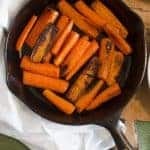 I love carrots, and this is a fun way to eat them without turning them into the ever-popular candied carrot. A little bit of good quality hard cheese grated right on top before serving was amazing on these (delicious, but not necessary or pictured). Savory and simple but magical! 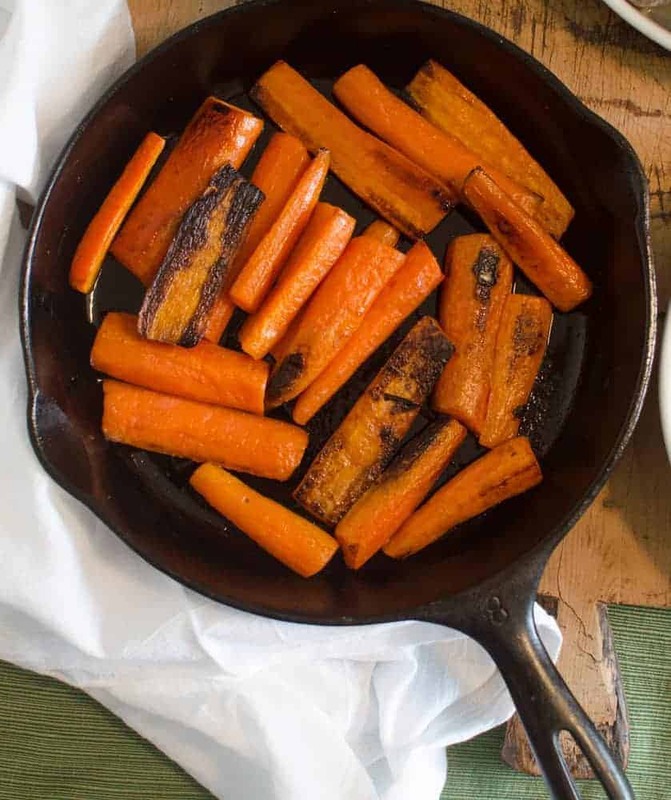 This five ingredient side is made by searing carrots in cast iron for lots of flavor. Peel and trim your carrots. Cut them into 3-4 inch pieces and cut them in half as needed. The goal is to have carrot pieces that are similar in size so that they cook uniformly. Add the oil to a large cast iron or oven proof skillet over medium high heat. When the oil is shimmering, add the carrots, cut side down. Let the carrots sear until charred, about 3 minutes. Remove the pan from the heat and turn the carrots over so that the seared side is up. Place the pan in the oven and let the carrots bake until they are tender, about 15 minutes. These would be delicious with a little bit of good hard cheese, like Romano or Parmesan grated on top just before serving. This simple cranberry sauce is full of color and flavor, and it’s naturally sweetened. I used both maple syrup and orange juice/whole oranges to sweeten the fresh cranberries, and it’s such a great combination. 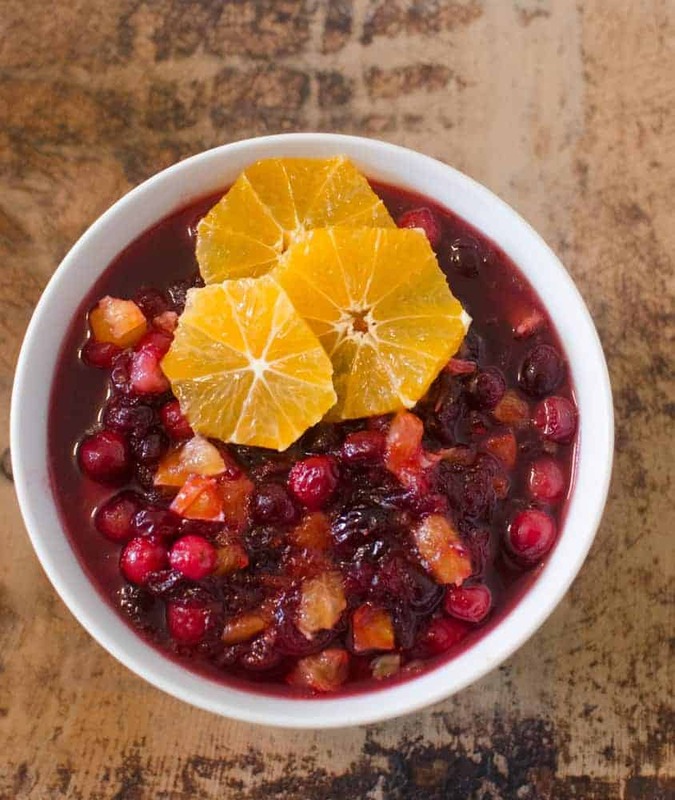 Orange and cranberry are just meant to go together. I love cooking fresh cranberries because as they cook and boil, they pop and burst open. It’s such a pleasant sound and the berries make the house smell amazing. This is a great addition to enjoy on top of your favorite turkey, chicken, or pork dishes. It keeps well too, so you can make it a few days in advance, which is always nice. If you like your cranberry sauce spiced, feel free to add spices like cinnamon, ginger, nutmeg, or cloves to your liking. I really like ginger in this dish, but only a little. 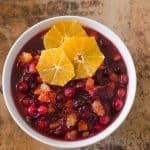 Classic cranberry sauce turned easy five ingredient sides pairs fresh cranberries with oranges for one delicious side. Add the cranberries, orange juice, orange zest, and maple syrup to a medium pan. Place the pan over medium heat and let it slowly come to a gentle simmer. Simmer until the liquid starts to thicken a bit and most of the cranberries pop, about 30 minutes. Remove from the heat and stir in your chopped orange pieces and a dash of salt. Let this stand at room temperature until thickened, and then serve cold or at room temperate. This relish is so good! I think of it as more of a garnish than it’s own dish though, and we eat it on top of our turkey or with pork roast/loin/chops. A little goes a long way. This freezes very well, so what you don’t eat, freeze for later. This is sweet, tart, bright, and delicious. If you like your cranberry sauce spiced, feel free to add what you like. Cinnamon, nutmeg, ginger, and cloves would all be excellent in this. Easy, seasonal, and so pretty! You don’t need to do a lot to make this salad shine. 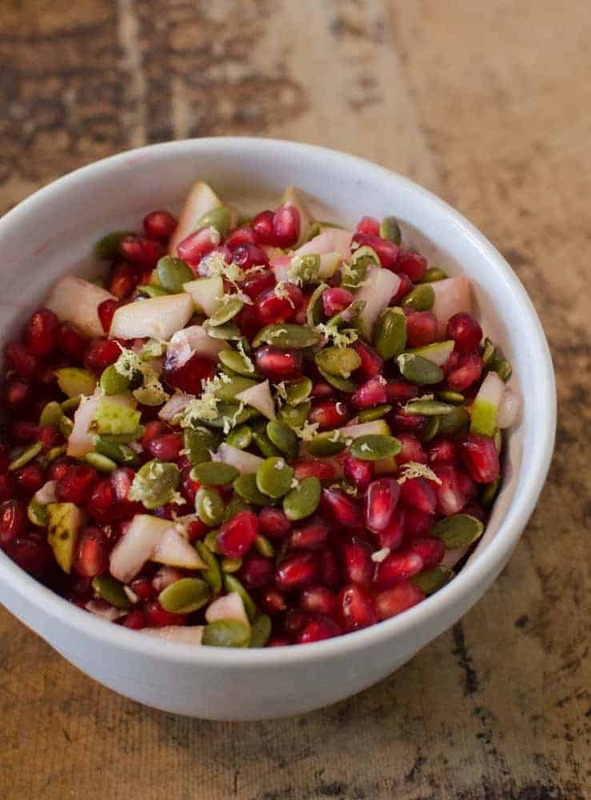 I just get a pomegranate all ready to go (I do the “cut it in half and hit the back with a spoon” method) and then add some pear and pepitas. I make a super simple dressing with a citrus fruit juice (like lemon, lime, orange, or grapefruit), zest, and some honey or maple syrup. It’s simple but so fun to eat. 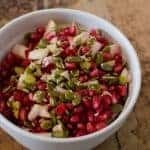 This is the easy healthy version of my very favorite Dixie Salad, which you might also want to put on your Thanksgiving table this year (it is pomegranate, apple, and pecans mixed in sweetened whipped cream; it’s a local favorite!). I love the pepitas (hulled pumpkin seeds) because they add some nice color and texture. They are so fun to have on hand. Simple sweet and crunchy fruit salad made with season fruit and a simple lemon dressing. This is one awesome five ingredient side. Add all of the ingredients to a medium bowl and mix to combine. If your honey is a bit thick, you might want to whisk it with the lemon juice and lemon zest before stirring it into the fruit. This is so simple but it’s such a sweet, bright, crunchy companion to any kind of meal. You can use any kind of citrus you want. Lemon or lime would make it tangy and bright, but you could also use grapefruit, blood orange, orange, tangerine, or whatever other citrus you have on hand. Use the same kind of citrus juice as you do zest and adjust the honey to taste. 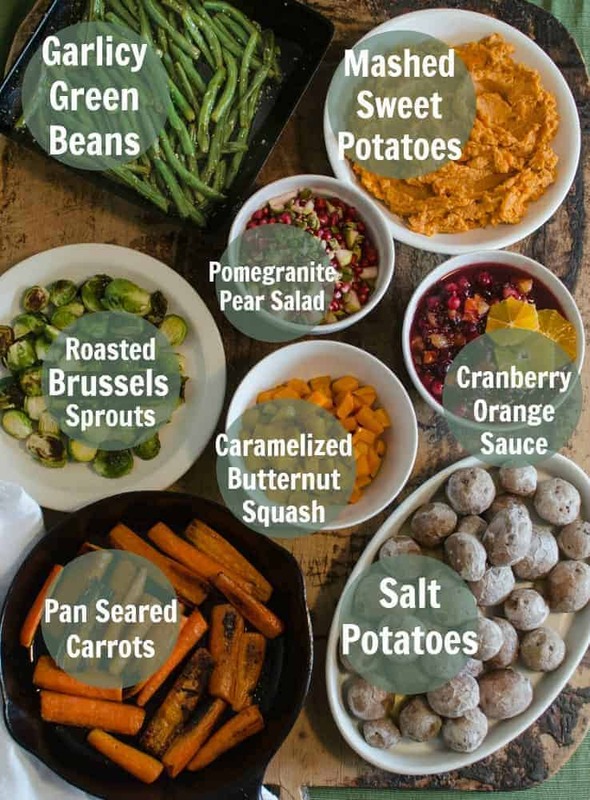 And there you have a great collection of simple healthy five ingredient sides for all of your holiday parties/dinners/winter meals/weeknights. I hope that you come back to this post again and again and again! If this post speaks to you, you think someone else might like it, or you want to save it for later, by all means, share it on your social media platforms. Pin it, Facebook it, throw a picture up on Instagram and tag me (#blessthismesseats). All of those things are incredibly helpful to me, and the more sharing that happens, the more I’m able to turn this hobby into a job that helps my family (and my house building project). There is so much power in your sharing – thank you for all you do. Now EAT! I love all of these! Those Salt Potatoes are forever my favorite (and EASY) potato dish. Thanks for the love for the cookbook. I’m thrilled you like the green beans! I finally found some little spuds to make the salt potatoes….they win the OMG amazing veggie award for the millennium! Thanks for posting this one!!!!!!!!!!!!!!!!!!!!!!!!!!!!!!!!!!!!!!!!!!!!!!!!! This is an awesome list! There’s nothing better than a 5-ingredient recipe — especially on a busy holiday. Great ideas!